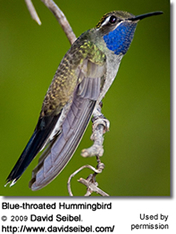 The following 11 hummingbird species (with photos and ID assistance) have been reported in Colorado. 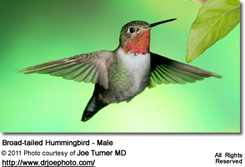 Migrating hummingbirds usually arrive in late April and leave in early September. 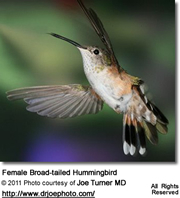 The most common hummingbird species are Broad-tailed, Rufous Hummingbirds, and Black-chinned Hummingbirds. 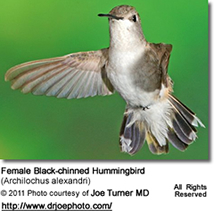 Black-chinned Hummingbirds, Archilochus alexandri - Native Breeders. Locally common. 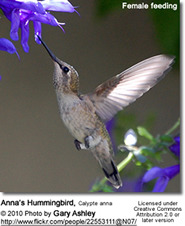 Usually arrive in their breeding territory at the end of May to mid-June. Some arrive early in late April. They usually leave in September. 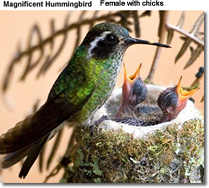 Broad-tailed Hummingbirds, Selasphorus platycercus - Native Breeders - Migratory hummingbirds usually arrives in its breeding territorry about mid-April. 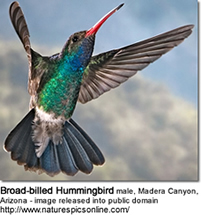 They breed across mountain forests and meadows throughout the Western United States from eastern California and northern Wyoming south through Great Basin and Rocky Mountain states to southern Arizona and western Texas. 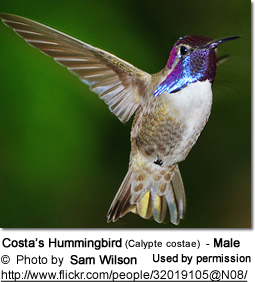 In September, they generally move south to winter in Mexico, Guatemala and, occasionally, El Salvador. 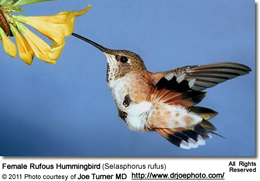 Calliope Hummingbirds, Stellula calliope - Native- Seasonal migrant. 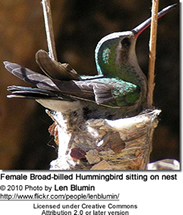 Usualy arrive at their breeding territories at the end of May to mid-June. They breed at high elevations in the mountains. Favor open shrubby areas. Migrate south to Mexico for the winter. 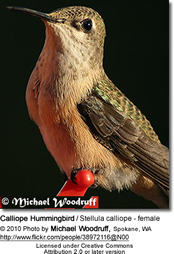 An increasing number of them now winter in eastern United States. 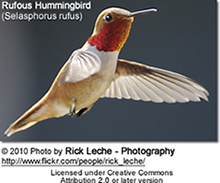 Rufous Hummingbirds, Selasphorus rufus - Native - Summer visitors / breeders - Arrive later in their breeding territories than other hummingbirds. Leave for their winter territories in September. 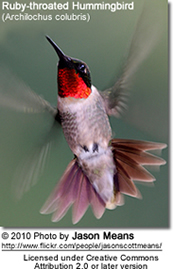 Ruby-throated Hummingbirds, Archilochus colubris - Rare Vagrants. 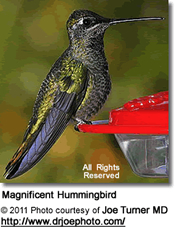 Anna's Hummingbirds, Calypte anna - Breed in open-wooded or shrubby areas and mountain meadows along the Pacific coast from British Columbia to Arizona. 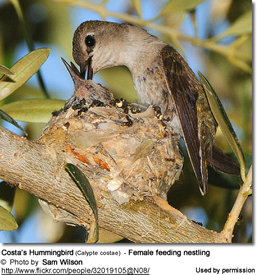 The breeding season may commence as early as mid-December or as late as June. 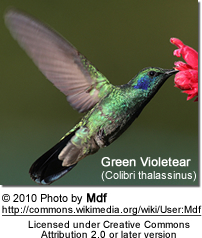 Broad-billed Hummingbirds (Cynanthus latirostris ssp magicus) - Vagrant Migrants / Summer Visitors - These mostly Mexican hummingbirds venture into the United States regularly; they mostly visit the southern parts - but a few vagrants travel as far north as Wisconsin. 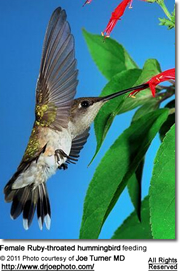 Hummingbirds favor red blossoms with a tubular shape. 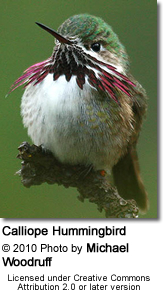 But they also feed on pink, orange, peach and purple flowers.